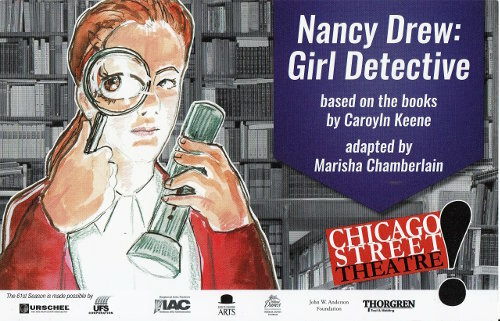 I was lucky to have a friend from Chicago send me the playbill from this 2016 production of Nancy Drew: Girl Detective, adapted for the stage by Marisha Chamberlain. This play is based on The Clue of the Dancing Puppet by Carolyn Keene. Dancing Puppet was published in 1962 and was written by Harriet Adams. It was the first Nancy Drew volume to be initially published in picture cover. Unfortunately, probably because of the name of the play, I found several reviews that said the play was based on the Nancy Drew, Girl Detective series of books. This is not true. Nancy Drew: Girl Detective was first presented by The Children's Theater Company of Minneapolis, MN, for the 1989-1990 season. I find it interesting that although the book came out in 1962 and was written as if it were contemporary to era, Ms. Chamberlain has the play taking place in the early 1940's. The play is described as being a fun, campy whodunit. 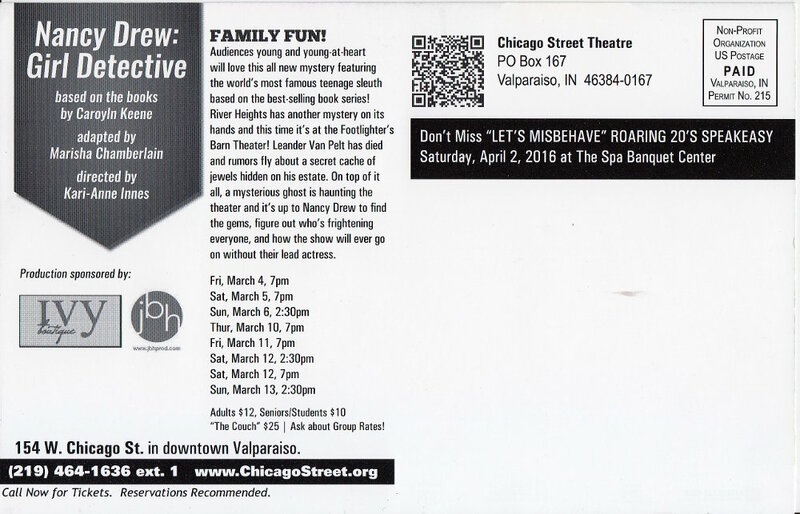 In a review of the Chicago Street Theater Production, written by Bob Kostanczuk, he quotes the director as saying that it was a challenge to present such a large-scale story on a modest sized stage. There's a lot of individual scenes and the director, Kari-Anne Innes noted that the play takes place in a lot of places with a lot of people. "Maximizing available space was key: We had to be inventive with stage design," said Innes. The role of Nancy Drew was taken on by Megan Bentley, a 15 year old sophomore at Valparaiso High School. The play was also performed by The Amarillo Little Theatre Academy for their 2014-2015 season. By amazing coincidence, Nancy Drew was played by a 16 year old, Megan Nair in Amarillo, TX. Oh dear, does this mean you have to be named Megan to be cast as Nancy Drew? I hope not! With more research, I did find girls not named Megan in the role of Nancy Drew. I look forward to future productions of Nancy Drew: Girl Detective. And I encourage you to look for it at a Children's Theater near you. A play written for High School Drama Classes is Nancy Blue, Girl Detective. The play was written by Megan Mostyn-Brown. (Again with the Megans!!) Framed as a radio play it is a creative and jaunty noir spoof of Nancy Drew. Nancy Blue searches to uncover who has kidnapped the high school principal. It won't be easy in a hard-boiled world of mounting suspicions and mysterious events—not to mention diva actresses, a stubborn rookie cop, a bossy older sister, and an AV Nerd who always adds her two cents. I only found three performances of this play on record. The Perry-Mansfield Performing Arts School and Camp, August 2011 and Stoneman Douglas High School in Tampa, FL, November 2015 and March 2016. The Perry-Mansfield kids watched Casablanca and Notorious to prepare for their roles in this play. The Perry-Mansfield School and Camp was created in 1913 and is recognized as the oldest continuously operating performing arts school and camp in the nation. The artistic community at P-M showcases original musicals, plays and dance theater pieces. Megan Mostyn-Bown said this when asked about writing plays that feature girl protagonists, "I used to be an actor and at the time, there weren’t a lot of plays that featured young female characters that I identified with. Or if there were, they weren’t the main character, they were somebody’s girlfriend or daughter, you know, stuck on the periphery. When I quit acting and started writing plays around 2002, I wanted to write about those girls."